* The introductory offer is available only once to any one person and to only one member of a household. Cannot be used in conjunction with any other offer. E&OE. It’s simple, complete four regular price haircut appointments within a 6 month period and your next haircut appointment will be FREE*. Present Clare’s Freelance Hairstylist loyalty card at the end of each appointment to gain a stamp towards your FREE* haircut. Once complete, present the card at your next appointment to claim your FREE* haircut. * Applies to haircuts only, excl. family packages. The four paid haircuts and FREE haircut must be of the same value. 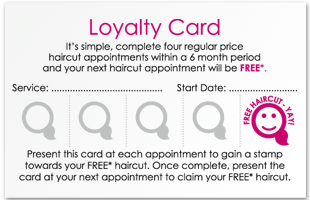 A completed loyalty card can only be used once to claim a FREE haircut and must be surrendered in order to claim the haircut. Loyalty cards remain the property of Clare’s Freelance Hairstylist and must be surrendered upon request. Cannot be used in conjunction with any other offer. E&OE. 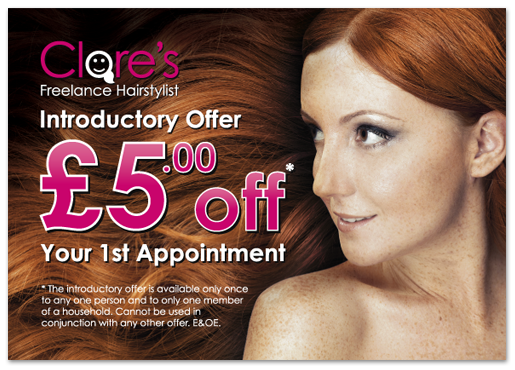 © Clare's Freelance Hairstylist - Based in Salisbury, Wiltshire, UK.